Matt Hamann (Jaster) has built an adorable steampunk walker. 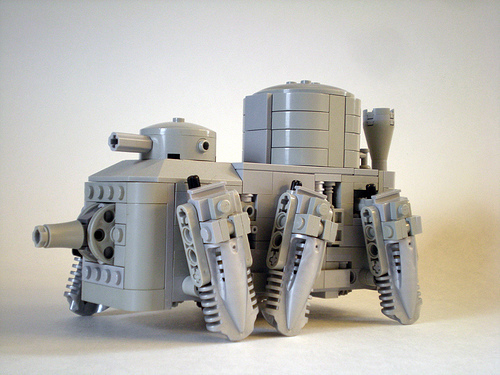 It’s a six-legged tank, that would be a pretty decent creation, if it weren’t for one thing… it can walk! He’s motorized it, and it sort of toddles along the table. Check out the video. I just love the way it clomps around, it’s like a six-legged toddler or something. Makes me want to build a motorized something and buy a pro account to post a video. Maybe that’ll be my next project. Awesome! It looks like some sort of motorized monster!